I've recently started playing around with software emulation of old Mac operating systems. One of my first Macs was a Quadra knock-off* running System 7.5, so I was pretty happy to fire up Basilisk II and see what it could do. While my primary objective was to play Prince of Persia and Indiana Jones and the Last Crusade, I ended up booting up Clarisworks 3.0 for a bit of nostalgic desktop publishing. When I was 14, I took it upon myself to publish a magazine/newspaper thing. It was a financial disaster, and it certainly did my social life no favours, but hey. It was something to do. Most of it, such as it was, was made in Clarisworks. Yay, Clarisworks. * When I say "Quadra knock-off", it was a Performa 580CD. It was a weird model that sat in-between the standard Quadras (the "real" Macs of the time) and the utterly bizarre Macintosh TV. The Macintosh TV was meant to be a kind of bridge between the personal computer and home entertainment, kind of like the AppleTV would eventually become, but it was a total failure. It was even designed with a black casing, to give the illusion that it's an appliance, and not a beige computer. The Performa 580CD had the same casing as the Macintosh TV, but in standard beige, and somewhat similar AV capabilities (no built-in TV tuner, just AV inputs). Unfortunately, it had sod all processing power and storage space, so it was pretty useless at anything involving AV. Its video input capabilities were limited to 320x240 pixel footage at a stonkingly low frame rate. I like Lego. Lego is awesome. 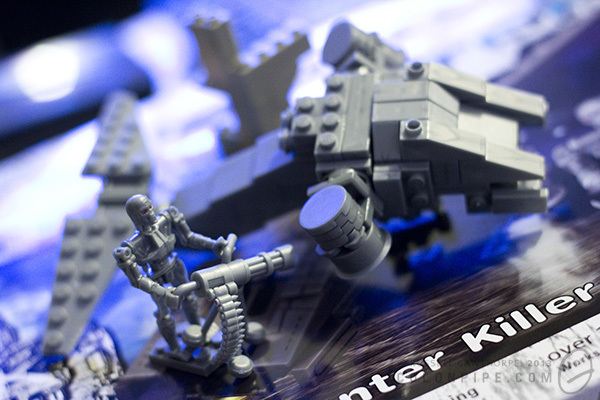 I also like that Lego, the company, has made a moral decision not to create military-based playsets. This decision has left the market open for Lego’s opposition to fill the void, which has lead to such things as Mega Bloks’ Halo playsets, Kre-o’s Transformers and Star Trek licenses, and Brickarms, a company dedicated to making authentic Lego-sized weapons for your minifigs. A company I’ve never heard of, Best-Lock, has now produced a small series of military sets based on the Terminator franchise (possibly as a result of the franchise’s ownership being in a state of phenomenal flux as we speak). They’re not the greatest quality, but you can’t get any other Lego clone products with the Terminator name on the box, so let’s give them a chance. Before I tear them apart, I’m going to be kind and point out that they were very cheap. I paid no more than three dollars for each set. Admittedly, this was from The Reject Shop, where all good products go to die, but I can’t imagine the retail price for them was significantly higher. Even at double the price, they’re dirt cheap for the quantity of Lego-compatible pieces they contain. The box is unassuming. I picked up two models, the Hunter Killer, and the Hunter Killer aerial. The company’s logo is quite disappointing. The choice of Arial Rounded as a font is questionable at best. The design of the package, in general, is chaotic and uncoordinated. It’s also not particularly colourful, which while appropriate for the franchise, is questionable for a toy package design. The box for the Hunter Killer (the non-aerial variant) features a couple of artificial red laser beams. Inside the boxes, the pieces are packaged in plastic bags with some stickers on a sheet. The instructions are loose inside the box. All of the pieces in the set are cast in the same colour, a kind of gun-metal grey. It's like IKEA, but with less allen keys. 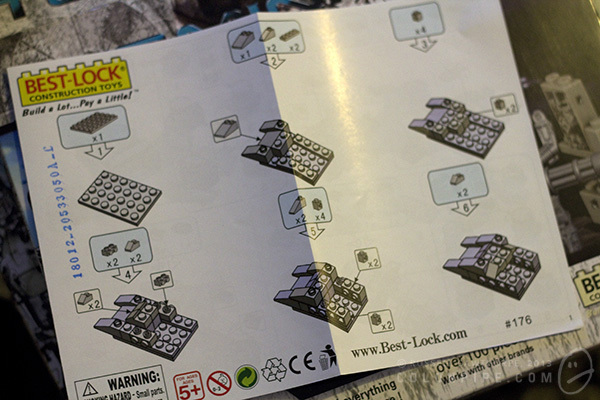 The instructions are easy to follow, but are far from the quality standard of Lego instructions. It's so close to Lego, but yet so far. The pieces are interesting. They’re similar to Lego. Most of the pieces serve the same function as a comparable Lego piece. Many of them have slightly differing engineering, such as the round plate pieces, which have additional reinforcements on the underside. The small 90-degree fold pieces with two studs on each side seem unique to Best-Lock. If nothing else, Lego’s competitors often stand a chance of producing a random significant piece that serves a purpose no official Lego piece was created for. The odds of this are decreasing daily, as Lego makes more and more unique pieces, particularly for its licensed sets (Lord of the Rings, The Lone Ranger, Teenage Mutant Ninja Turtles, etc, and -- of course -- Star Wars). These pieces will be handy if you ever need to build a tripod-mounted gun cylinder...thing. Here are some of the unique pieces you won’t find in Lego -- the gun turret comes in three parts, a tripod, the gun itself, and a small ammunition belt that clips on in a similar style to a minifig’s gripping hand. The round piece with the flared bottom connects to a piece with an upright, making a large, spinning turntable piece. The Terminator figure is quite detailed. It’s also quite fragile. The arms are articulated at the shoulders and forearms, the legs only at the hip. The head rotates. The hands don’t grip anything particularly well, and placing the awkwardly shaped minigun into its pincers is more of a balancing act than a satisfying job. I don't think he'll fit inside. 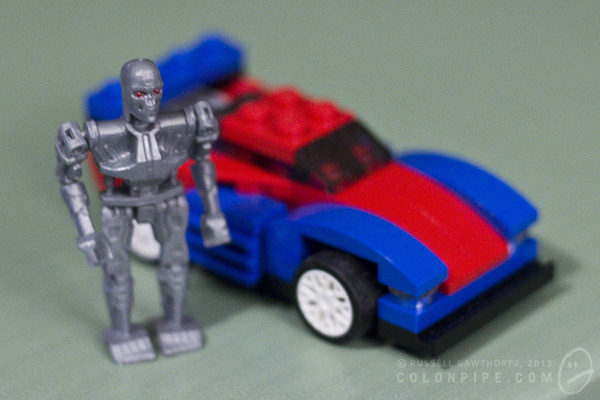 Here’s a size and quality comparison of the Terminator figure alongside a genuine Lego Creator set. While the creator set was never intended to be the correct scale for a minifig, you can still get a reasonable idea of the size of the scrawny Terminator in comparison to Lego pieces. I think the Terminator is aiming at his own plane..thing. 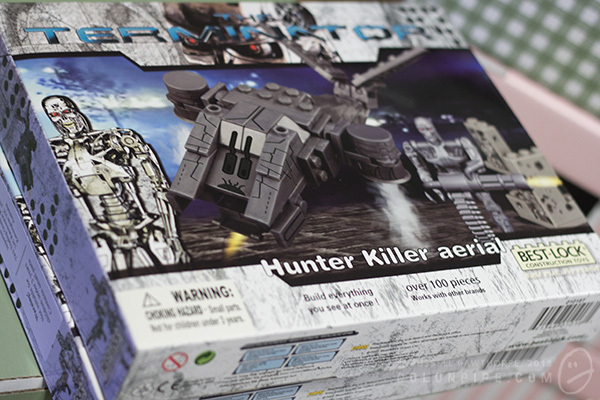 This is the completed model of the Hunter Killer aerial, with the terminator swinging his minigun alongside. The pieces have a mottled sheen to them, as evident on the sloped pieces that make up the HK’s front end. You can see here that some of the pieces connect together quite poorly. Some of them simply don’t like each other, while some of them have obvious flashing problems from the way they’ve been moulded. You can see numerous moulding problems in this photo. There's a certain level of "number five is alive" to this model. This is the other Hunter Killer. The non-aerial one. If nothing else, the track system is very cool. It looks good, and within reason, it works as you push the thing along the table. The dog-leg in the tracks at the bottom, where it tucks up between the main wheels, is a bit of a design flaw. The piece holding the track up is simply a small cylinder with a cap on it, and it has a tendency to fly off when the track moves, or simply fall off periodically from the tension of the rubber track. The little cones that make up the turrets on either side of the machine don’t seem to click in particularly well, and fall off often, also. The kits come with stickers to add panel detail and markings to the vehicles, but I haven’t added them as I’ll probably be taking the units apart again when I run out of shelf space. I’m quite confident that the stickers are actually intended to be structural, and will stop a lot of the connection problems with the main components of the vehicle bodies. I’m fairly sure Lego’s official sets do not employ load-bearing stickers as part of their design. Final verdict for the Terminator Best-Lock construction kits: They were very cheap, the quality is no better than “okay”, and they’re a piece of licensed Terminator merchandise. I don’t feel that I’ve wasted my money. I don't usually share and link stuff, but hey. Here's a little article about a girl and her calculator. Her calculator isn't haunted, but I won't hold that against her. She took her Texas Instruments model 84 calculator to prom. As her date. Yeah. Turns out she even made it a little tuxedo, and everything. Repeat after me: "Aww." Sourced from Geekologie, Unrealitymag and a bunch of other sites. 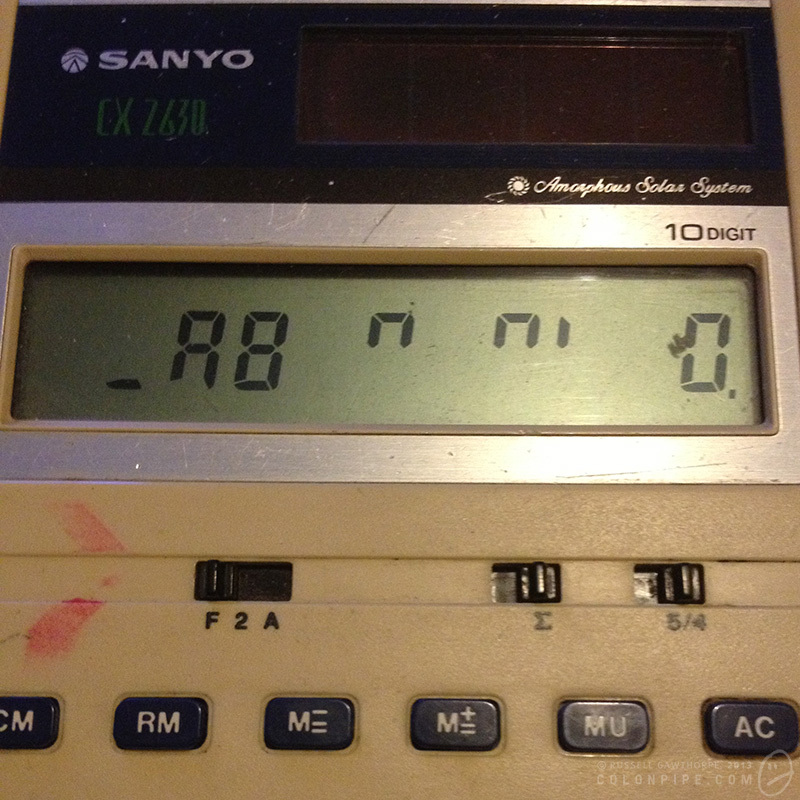 Here's the original tumblrism, from ishipitlikeups (and her calculator). @greatdismal: But I wish the Heroes of Science action figures were dressed symbolically, rather than in their boring real outfits, eh? @margaretatwood For me a huge part of the charm lies in their schlump scientist outfitting. @ajkandy @greatdismal : Me, waiting for the Glo in the Dark Marie Curie(sorry, bad joke). ..I did say it was a brief discussion. Extra love to the others who joined in on the conversation to point out the lack of women in the original image. Check out the FAQ for reasoning behind this, and also check out the sequel for more scientists (and more women!). Thanks for your continuing support, folks! Here I am, back in the late '90s, critcising Apple in MacFormat magazine's letters section. Incidentally, at some point in the past couple of decades, they fixed both of those pronunciation problems. I'd like to think I had a part in that. I'm an alpha-tester from way back. THE FREAKING THING IS HAUNTED. Tucked away in a dark drawer, devoid of fluorescent "solar" power, its twenty year old batteries fail, and it loses its mind. Grasping at the last vestiges of its consciousness, it types a garbled message, leaving it on the screen for me to wonder about the next morning. I've kept a log. Every time it's left me a message, I've recorded it. The original purpose of this project was simply to see if it was ever the same. Was the message similar, day in and day out? Was it just random crap? (Hint: probably!) Was there a hidden logic? I'll let you decide. Big gallery to follow, with commentary. Hit the jump. I've been screwing around with various "vintage effect" iPhone apps, including Hipstamatic, Instagram and a few others of significantly lesser quality. I've started to form the germs of opinions about these apps, and I'm going to attempt to put those opinions into coherent sentences. First, lets explore the apps. Hipstamatic is an "emulator" of the Hipstamatic 100 camera, a possibly fictional camera that sold very few units in the 1980s. Functionally, it's the equivalent of an Instamatic hand-held camera. The software includes a bunch of effects in the guise of "films", "lenses" and "flashes". Additional effects can be purchased for a nominal fee. Films give a range of grain, border and colour effects. Lenses give depth of field (faked, of course), focus anomalies and light leaks. Flashes overlay a coloured gel to the image, while also invoking the iPhone 4+'s built-in LED flash. These three classes of effect can be used as intended, or mixed and matched by means of your own preferences, or random chance. Shaking the unit mixes all three effects randomly, leading to the need to take each photo several times, shaking between, to ensure you don't snag one of the myriad less desirable combinations of effects. And oh, yes indeed, they can be undesirable. Horrific combinations can be achieved by combining lens and film effects centuries apart in design. The 1990s film that borders your image with coloured sellotape is particularly horrifying, coupled with an antique Tinto lens it's truly ghastly. Tri-coloured flashes are atrocious. The Salvador Dali film and lens combination is designed solely to pop up occasionally and make you swear loudly as it ruins otherwise good photographs with its peculiar overlaid effects. Instagram is a different animal entirely, geared primarily toward image sharing. The sharing engine -- recently bought by Facebook for one gazillion dollars and the subject of much privacy concern after a misread alteration to its terms of service gave the allusion the company would sell your soul with your photographs to the nearest punter -- is not the part I'm concerned with today. The effects and filters, though, are. Like Hipstamatic, Instagram offers the ability to whack on a bunch of effects. The image border and overall colour alterations are handled within a single "film" option, with about twenty different choices at time of writing, with the option to kill the border, auto-enhance the image and apply circular or "tilt shift" depth-of-field effects. As a result of the way they're constructed, both of these apps have a different effect on your photography. Hipstamatic places the quality of your end result largely in the hands of the Gods, while Instagram gives you the ability to rub various kinds of funk on an otherwise ordinary image to make it look good enough to pollute your friends' Instagram feeds. The issue I have with these apps is that they tend to remove the onus of responsibility from the photographer, instead allowing the person pressing the button to either blame the filters and effects for ruining an otherwise decent photo, or entirely taking self-credit for a stultifyingly boring image enhanced pointlessly with vintage funk sebum. Many of the photographs I took with it, however, were not so great. This little camera gave me a super power, though: I could blame the camera. I had no controls to mess with. I had no options that could improve the image. While I could always criticise my skills in Photoshop, there was no way I could have produced more information in any of the photos I took, because there was literally nothing I could do to make them "better". Hipstamatic and Instagram are much of the same. They're a point of blame, and a source of false credit. They're cool, don't get me wrong. Many of the images look awesome. I'm really fond of the recently released Tintype set, with daguerrotype and colourised tintype films, which look amazing. I'll also continue to use them, simply for the virtue that they tend to make otherwise boring photos interesting. I'm going to make a concerted effort never to feel pleased with the result of a Hipstamatic or Instagram photograph, though. It just doesn't seem right. There seems to be quite a strong mentality these days that one shouldn't answer phone calls that come from blocked numbers -- that is, phone numbers with their caller ID suppressed. I find this interesting. I did a bit of Googling, and I've discovered heaps upon heaps of people who refuse to answer them, often on entirely vague or misguided grounds. I have a number of plausible theories for why people do this, some of which can be combined together: 1. They're expecting bad news. Or they owe money. While it's probably better to answer a telephone call from a debt collector than have them come knocking on your front door, I can at least understand the logic behind avoiding the call. 2. In the '90s, prior to the ACMA Do Not Call Register being introduced to Australia, there was a strong predilection for telemarketers to use blocked numbers when calling. A lot of these companies would also employ computer systems that would automatically dial from lists of numbers, confirming a number's validity when someone answered. These culled lists of numbers-that-get-answered would then be sold on to other telemarketing companies for a sizeable profit. Since the introduction of the DNC Register, it's illegal for telemarketers to call, period, let alone use blocked numbers. That's not to say that a scad few don't choose to break the law and call anyway, but the odds have reduced significantly. Charities and other organisations that are immune to the DNC Register are required to have their numbers visible to the receiver, so that removes them from the equation. 3. Psycho exes, drunk friends, whatnot. You can opt for your own telephone number to be made silent/blocked/private. Some handsets differentiate between blocked numbers and private numbers. Dialing 1-8-3-1 before the recipient's number will temporarily make your Australian phone number into a blocked number, so it's entirely possible to prank call people in this fashion without having a prior arrangement with your telco. In the scenario of these types of calls, I can once again understand the decision to not answer. • Many businesses, particularly doctors and large agencies (to give only two examples) use blocked numbers for a perfectly practical reason. Doctors want to be able to contact their patients to deliver news or test results, but they don't need the patient to be able to call them back on their own personal desk phone with every little itch and malady. That's why there's a receptionist and a system to make appointments. Agencies with call centres use blocked numbers because their staff are often trained in specific tasks (such as performing a data fix on client accounts, for example) and only need to contact the public for specific information. There is no reason that the recipient of the call should ever need to contact the staff member again, because the staff member is not trained to help with general enquiries. It would be a waste of the company's resources to make public the staff's individual extension numbers, because the phones would then be ringing with calls that could not be acted upon by those answering them. • "If you need to contact me, I have the right to know who you are". Fair enough, but why don't you ask them when you answer the phone? If I was calling from a number that you wouldn't recognise, what would make you answer that number in contrast to no information at all? You can always hang up. My work calls me from blocked numbers. That's a pretty good reason to answer them. But maybe that makes me unique. behaviour, blocked numbers, people, Ring Ring, telephone, Who're you hiding from? I very much regret having been born 20 years too late to truly appreciate the space program(s), and their effect on society. I grew up in the era where Star Wars was so much cooler than our actual astronauts. I grew up in the era where the space program was waning into ubiquity, no longer a frontier to be challenged as much as a scientific chore to be begrudgingly satisfied. In the '80s, we did develop the Space Shuttle, the first re-usable spacecraft. But we'd already been there, just not in such a nice plane. Obviously, now we were able to come back in the same plane, not a glorified bucket with a parachute on, but still. It was nothing new. Regardless, I love the space age, the space race, the moon missions, all that jazz. I love that people have dedicated their lives to it, in many cases quite literally. I've been doing a bit of research recently, and I've discovered that the world (and another one, we'll get there in a moment) is full of little (and not so little) memorials to people who've died while pursuing mankind's greatest adventure. I've compiled a little list. Please bear in mind that this is not a "top ten", and these aren't ranked. Because they're freakin' memorials. That's just rude. Having said that, though, the last one is really cool. The Astronaut Memorial, at the John F. Kennedy Space Center in Florida, is a gigantic polished granite block bearing the names of 24 astronauts who have died. The astronauts names are arranged in a logical scattering, and are cut entirely through the block, so light can shine in from behind and illuminate them. Originally, the entire thing was on a giant rotating mechanism with a tracker to keep it facing the right direction for the sun to make the names glow, but the mechanism failed in 1997, and a decision was made not to repair it, as the phenomenal amount of money needed to repair it was deemed better used for education. Which I heartily agree with. Laika was the first dog in space. In 1957, she became the first living creature to orbit the earth. No provision was made in her crude spacecraft, Sputnik II, for her to return safely to Earth -- rather, she was intended to be euthanised by poisoned food after completing a few successful orbits. During the launch sequence, a malfunction caused part of the heat control system to fail, which unfortunately lead to Laika only surviving a few hours into the first orbit. Laika, fittingly, has two memorials. One with her fellow cosmonauts, at the Monument to Conqueror's of Space, and one on her own, standing atop a rocketship near the Moscow Military Medicine Institute. You can see a picture here. Speaking of memorials to Laika the space dog, if you're into crying volumes of tears, here's Rockleetist's English-language cover of the Hatsune Miku song "Laika". If you like dogs, it's pretty torturous. This 110m-tall stylised titanium spire lives in Moscow, behind the Memorial Museum of Astronautics. The thing is actually a curved obelisk, shaped like the exhaust plume of a rocket, with a rocketship sat atop. The whole thing is plated in titanium. At its base, a statue of Konstantin Tsiolkovsky, one of the pioneers of astronautics. The Apollo 1 launch platform (also used for Apollo 7) remains in living memory of the three astronauts who were lost in the Apollo 1 fire in 1967 -- Gus Grissom, Ed White and Roger Chaffee. You probably remember the concrete structure from its appearance in the film Armageddon. By far the coolest, and possibly most emotional memorial to lost astronauts is the three-inch-tall aluminium spacefarer left on the surface of the moon by Apollo 15 in 1971. Here's the Wikipedia page about it. The statue was created by a guy called Paul Van Hoeydonck, and it now resides in Hadley Rille on the lunar surface.